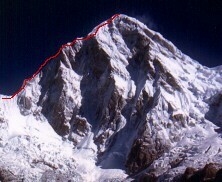 EVEREST TRAINING CLIMB HAS MOVED- CHECK OUT THE NEW "TRIPLE CROWN"
This is our 8th expedition on Mount Pumori since 1998. Some with success, all without incident. IMPORTANT! - A must read on the South Ridge verses the standard (East Ridge). No high altitude experience necessary. It is mostly a snow climb up fixed lines that we will all take part in fixing. Some snow/ice climbing ability really helps here. You will need crampons and an ice axe for some of the snow/ice and mixed stretches, so experience with use of these is mandatory. Of course you will need to be in an above average shape and a positive mental attitude is as important as good physical condition. South Ridge- a scramble to (ABC) Advanced Base Camp, gradual to steep snow to Camp 1, to camp 2 mixed snow & ice (grade 3 ice) & rock 5.4 easy to moderate, summit day is steep snow 55 degrees. Some rock climbing ability really helps here. You will need crampons for some of the snow/ice (the upper mountain) and mixed stretches, so experience with the use of these helps a lot. Of course you will need to be in an above average shape and a positive mental attitude is as important as good physical condition. A $1000.00US deposit is required to hold your spot on the team. The final amount will be due 8 weeks prior to departure. Charter transport from Kathmandu to Lukla return. Cargo of gear to Lukla, porters and yaks to base camp and return to Kathmandu. Teahouse- Sherpa Lodge accommodation and meals on the trail to base camp and return. Base camp facilities and camp crew and all meals at base camp. All group technical gear and rope. All on mountain tents, stoves, fuel. Peak Fee, Nepalese Govt. and Nepalese Agency Fees. Leadership Tim Rippel- Avalanche Forecaster and Mountain Rescue professional. Over two decades of experience. Airfare to and from Kathmandu from your home. Kathmandu accommodation and meals. Budget $22US to hotel and $20 to $25US for meals. Nepal visa entry fee $30US and International Departure tax of 1695NRS or $16US. Personal travel accident and rescue insurance. Personal climbing equipment and all other items of personal nature. October 4- (Date team is to be in Kathmandu.) Upon arrival check into the Nirvana Garden Hotel situated in Thamel the cornerstone of the Kathmandu scene. October 5: Kathmandu. From the centrally located Nirvana Garden Hotel we begin our exploration of Kathmandu while doing last minute expeditions shopping and packing. While modern by Nepalese standards, Kathmandu is a sacred city to both Hindus and Buddhists. Our tour is an important introduction to understanding the cultures, which lay ahead. Kathmandu is prominently featured in both Buddhist scriptures and Hindu texts such as the Ramayana. We highly recommend taking in a self guided or guided tour of the 3000-year-old Swamayabhu (monkey temple), the great Stupa of Bodnath and the chaotic Hindu temple complex of Pashupatineth. This temple is home to many Hindu aesthetics or Sadhus. October 6: After final administration requirements, we fly to the landing strip in Lukla. Weather permitting, this flight offers outstanding views of the eastern Himalayas. In Lukla, we meet and join our Sherpa staff, load the yaks and begin the ascent to base camp. Our first day is an easy walk to lush environs of Monjo, located on the Dudh Kosi River. No time is wasted on the learning aspects of this expedition. 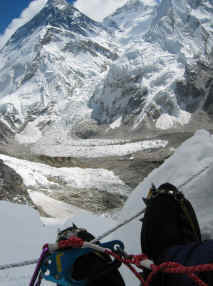 Evenings throughout the trek will consist of learning assessing rope skills needed for a Himalayan climb. October 7: We follow the Dudh Kosi, ascending 700 meters through Himalayan pine and Deodar cedar forests, to the celebrated village of Namche Bazaar (3445 meters). The village of Namche is an historic trading post where Nepalese and Tibetan traders exchange salt, dried meat, gold and textiles. Besides being a superb place to shop for traditional crafts, Namche remains the central trading post in the Khumbu, attracting Himalayan and lowland merchants. Our group spends two days in Namche affording us the opportunity to acclimate, visit local markets and spend time with friends in town. Our camp is perched high above the city and we make our way to nearby high points to capture our first glimpses of Ama Dablam, Everest and neighbouring peaks. October 8: Today is acclimatization day. Take a hike up to the twin villages of Kunde and Khumjung home of the climbing Sherpas and the Sir Edmund Hillary School. In the afternoon take in the sights in Namche Bazaar including the Sherpa museum and local marketplace. October 9: Trek to the village of Tengboche (3866 meters), the cultural and religious center of the Khumbu. At the monastery we attend Buddhist ceremonies and rituals performed by local monks. Vistas from Tengboche are spectacular. The jagged peaks of Thamserku and Kangtega stand to our south, as Everest, Lhotse, Nuptse and Ama Dablam are visible to the north. The Monastery at Tengboche is one of the most well known in the world as the Rinpoche is revered throughout the Buddhist community and has authored a number of books and essays. In the past our groups have had an audience with the Rinpoche and received his blessing. This is often a moving and intense experience. Views from this locale (one of the finest on earth), include Kwangde 6186 meters, Tawachee 6467 meters, Nuptse 7878 meters, Lhotse 8500 meters, Everest 8852 meters, Ama Dablam 6857 meters, Kantega 6778 meters, Thamserku 6607 meters. After visiting Tengboche we move to spend the night in Pangboche. October 10: This morning we make visit Lama Geshi for our private Puja ceremony to bless the expedition before making our way up to Dingboche for the night. October 11: Trek to Dugla, overnight in the lodge along the raging river coming out of the Khumbu Glacier. October 12: Trek to Pumori base camp and settle in the comforts of your base camp established by our sherpa crew who has gone ahead of us. October 13: Rest, adjust to the altitude and start preparing for instructional sessions and organizing equipment. October 14 to November 1:- Working on the mountain climbing and training to be ready for a summit bid during this time. Extra days have been included for inclement weather. Novembe 2: Rest day in BC and pack up to depart. We utilize local teahouses for lodging along the trek in to base camp. Peak Freak Expeditions Inc, is a owner operated 8000m Expedition company led by Canadian high altitude guide Tim Rippel and operated by his wife Becky Rippel an international travel specialist. We are small but our success is big. To help our members reach their individual goals safely while enjoying an intimate mountain experience, we keep it that way. "For over a decade now we have helped climbers, trekkers and skiers take their mountain aspirations further than they could ever dream, from the ascent of an exhilarating trekking peak to climbing Everest itself. We are a specialized mountaineering and adventure operator. We lead the way in providing state of the art equipment and the highest quality of food. Our sherpa staff includes some of the most sought-after in the Himalayas. Many with multiple Mt. Everest summits to their credit. 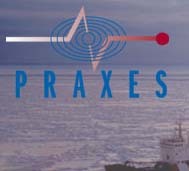 Our mission is to lead the way for the best possible chance for success and adventure one step beyond your expectations."